Bearded Ladies CEO John Jarboe sees the Land of Make-Believe as the world of drag. Jun. 14, 2018, 11:45 a.m. The first black-and-white frames of Morgan Neville’s Won’t You Be My Neighbor show the familiar Fred Rogers at the piano, coolly attempting to place value and meaning on his approach to communicating with children by way of modulation. As a trained classical composer, he knew that some key changes could be managed with ease, and others could not. They’re trickier. Rogers felt the same way about children. They shouldn’t be handled or talked down to. They shouldn’t be entertained with slapstick or exposed to violence. Every child must be looked at in the eye, tenderly, and understood — carefully, directly and patiently. You must reach each child. That earnest ideal guided the Protestant minister Rogers through all of his work as a PBS television presence, and through personal appearances — including one with a gorilla that was so kindhearted, just thinking about it brings tears. And it is that humane, benevolent sense of caring and reaching through a frightening and unpredictable world that spills onto every frame of director-documentarian Neville’s new film. The documentary is but one of the many multimedia projects celebrating Mister Rogers’ quiet dignity. A majority of the 895 episodes of Mister Rogers’ Neighborhood (1968 to 2000) have been released on Netflix and Amazon Prime, and a biopic of his life, starring Tom Hanks, is due out in summer 2019. Then there is Philly performance artist and Bearded Ladies Cabaret CEO John Jarboe, whose non-biographical, LGBTQ take on the ethos of earnestness can be witnessed through “a musical healing ritual for adults”: You Can Never Go Down The Drain, starting June 20 at the Wilma Theater. Returning to Won’t You Be My Neighbor, director Neville has filled his documentary with familiar PBS footage, such as montages of changing from sports jackets into comfy sweaters and shoes into sneakers, as well Rogers & Co. assembling with the magic kingdom of sock puppets.The explanations of what each movement and each puppet means within Rogers’ psyche — and the connection with his real world relationships — that will warm any viewers heart. This does not mean that Neville revels in any deep secrets or psychological scars from Rogers’ past, beyond some bullying and overweight issues as a child. 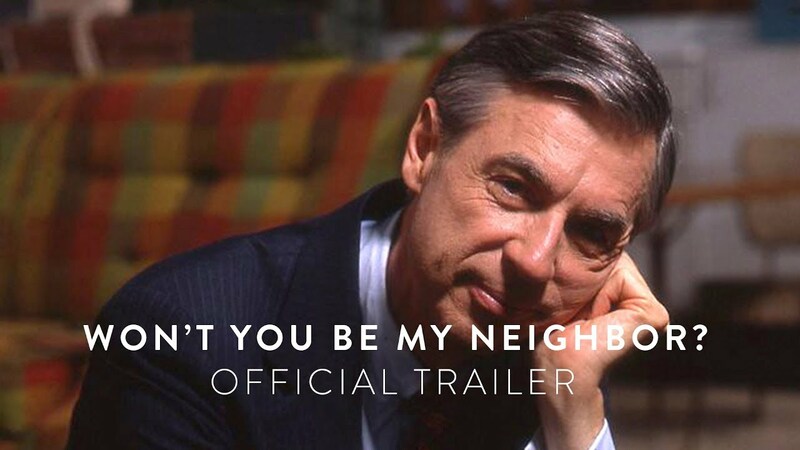 Instead, Won’t You Be My Neighbor looks at what Mister Rogers’ onscreen persona held for its viewers and his co-workers, and how the impact of these relationship play into the greater meaning of what and who he was. The movie examines all this via the lens of the culture of the times. Take Officer François Clemmons, a gay black man who, in 1969, asked to soak his feet alongside Rogers’ in a kiddie pool on a hot day. At a time when segregation, at pools as well as other places, was a hot button issue of Southern repression, there was Rogers drying off Clemmons’ feet. As stated by Rogers, The Neighborhood of Make-Believe was a fiefdom, and the sweater/sneaker neighborhood was a kindly idealistic place where problems of the world were solved sympathetically, patiently, smartly and allegorically — which allowed children an eye and ear into the abstract as well as the real. “Let’s make the most of this beautiful day,” Rogers sang at the start of each episode. No matter how rough that could be, Rogers was hell-bent on making it so. Which itself is a kind of costume, notes Bearded Ladies’ Jarboe, who refers to the character he will play on stage as “Mx. Rogers,” a non-binary honorific. Jarboe doesn’t claim to speak for the culture at large, but does know Fred Rogers is one of the most quoted celebrities and educators on the planet. He plays into that myth and that mirth with giddy aplomb.